MobilBet is a modern online casino that is instantly accessible to mobile users and is greatly optimized for mobile devices providing endless fun and entertainment at the touch of your fingertips. Being fully licensed and absolutely safe, the casino has 500+ slots, roulette, blackjack and other enjoyable games produced by NetEnt, Microgaming, Play’n’ Go, Yggdrasil and other world leading developers. MobilBet offers a professional support team, flexible banking tools and a visually appealing design. All the games are published on a dedicated page creating a long list arranged in columns. To customize the way the games are displayed, a user can sort and filter them by developer, ranking, and other parameters. Some games are tagged as “Hot” meaning they are currently awarding above-average payouts or producing a winning streak. 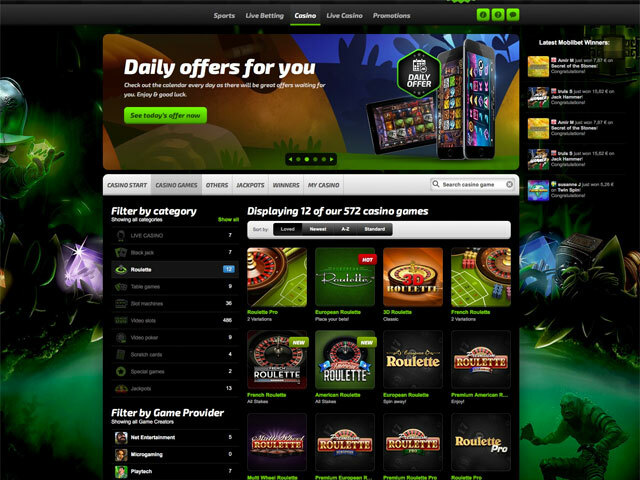 Players can test any game in a free mode or choose to bet real money; in the latter case, a player must sign up first which is very fast and easy. The minimum amount for a single cashout transaction is $20, while the maximum amount depends on the rules of a payment system selected by a user. The minimum sum of money for deposits is set at $10 per deposit request. The customer support can be reached quickly and easily via a live chat, by email or phone. Multi Wheel Roulette by Playtech (table limits: $1 to $30,000, or max $5000 per wheel). This is actually a European roulette with up to six wheels to bet on. Along with the roulette variants listed above, MobilBet offers some more European roulette games as well as a few French and American variants developed by the said vendors, and three live roulette games by Evolution Gaming. The casino awards loyalty points for logging in, depositing, placing real money bets, verifying an email address and for many other actions at the casino. One dollar wagered in roulette earns 2.4 points. On accumulating 7000 points, a player may visit the MobilBet Shop and exchange the bonus points into lottery tickets, free spins, instant cash and other goodies.